Two years ago, trans activist and performance artist Travis Alabanza had a burger thrown at them along with a transphobic slur. No one intervened. 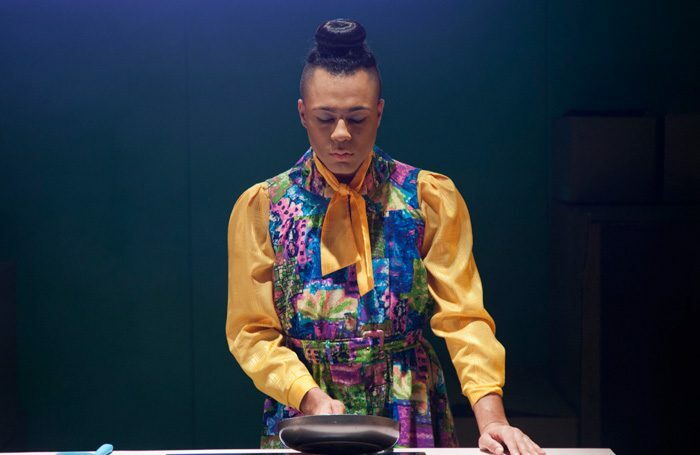 In Burgerz, cooking a burger onstage becomes a vehicle to process the incident and years of gendered control and repression in Alabanza’s life. Alabanza addresses the pressure to reenact the violence outright onstage. Instead they draw strength from global traditions of gender diversity and charge the audience directly to do better. Alabanza sheds a plain blue jumpsuit to reveal a bright frock and purple heels as the burger is assembled, cooked and served from a kitchen, part of Soutra Gilmour’s pristine set. A useful multitude of cardboard boxes inside the cuboid that houses the kitchen would be enough to make Alabanza’s point without their statements about “colouring outside the lines” with gender. Alabanza keeps the piece moving, drafting in a male audience member to help with food prep while questioning him about his manhood. Is he a man who cries? What about when not chopping onions? Alabanza is at their poised best when improvising with the audience, funny and knowing: the scripted laughs are easy to spot coming though not all the jokes land. Against a backdrop of pink light and organ-like chords, this exploration of the threat that trans people continue to face feels at once a little heavy-going – and absolutely vital.